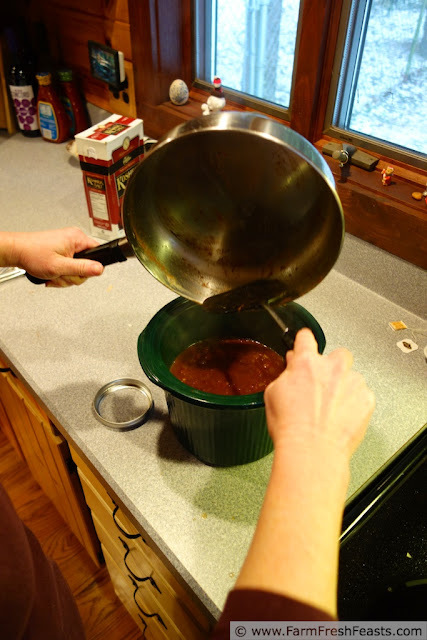 Have you ever made a recipe for the first time, in someone else's kitchen, for a crowd? Scary thought, no? I'd bookmarked this recipe, Slow Cooker Chicken Tikka Masala by Rebecca of Foodie With Family because my family loves Indian food, I love my slow cooker, and her directions seemed clear, easy, and very do-able for me. I just didn't know when I'd get around to making it. The wonderful thing about joining a CSA is that you've got seasonal farm fresh vegetables flooding into your kitchen every week. The annoying thing about being in a CSA is that you've got seasonal farm fresh vegetables flooding into your kitchen every week. What if you feel like eating tomatoes, the canned ones you've put up, but you've got fresh spinach, Band Fruit Fundraiser citrus, and the Strategic Winter Squash Reserve staring at you reproachfully? You use the spinach in this, or this, or this. You use the citrus in this, or this, or this. You use the Strategic Winter Squash Reserve in this, or this, or this. You regretfully turn away from your canned tomatoes, knowing that they will be waiting for you when you've dealt with all the fresh stuff. And then you run away! You run away to visit your in-laws. You know that everyone likes to sit down together around the big table and enjoy a meal, and it's awfully nice not to always be the one to make the meal. So you offer to make a meal one of the nights of your visit. But what to make? What will appeal to 4 generations of eaters? I decided to go for it and make this meal. For the first time. Not in my own kitchen. Not just for my family. Sure, I played it safe and brought with me almost all the ingredients (since I had everything but cilantro on hand already). I brought my own slow cooker and my own rice cooker. I even brought my own measuring spoons! You know what happened? Thanks to the clear directions, great photos, and excellent recipe it worked out just fine. It went together easily, the whole crowd ate it, and some even went back for seconds. This recipe is easy to make. Click here to read it! This post is the second in an on-going series about how Food Bloggers Change My Life. You don't remember reading the first in the series? Yeah, you're fine, it's not live yet. I wrote it up after making Chicken Cider Stew from Alanna of Kitchen Parade and A Veggie Venture, but since I'm all about seasonal eating and it's really not cider season, it will be up in the fall. Meantime, since you've hopefully got jars of crushed tomatoes you put up in the fall . . .
You need a bunch of ingredients, but many of them are pantry staples. Chicken thighs, greek yogurt, cumin, coriander, kosher salt, chick peas, butter, onion, garlic, garam masala, tomatoes, ginger, sugar, cornstarch, Basmati rice, oops-the peas were hiding in the freezer. Cream, fresh cilantro, and naan were still at the grocery store when I took this photo. Dump it in the crock pot. I am using less meat, so I subbed a can of chick peas (drained and rinsed) and dumped that on top. I also used less butter, and more tomatoes. 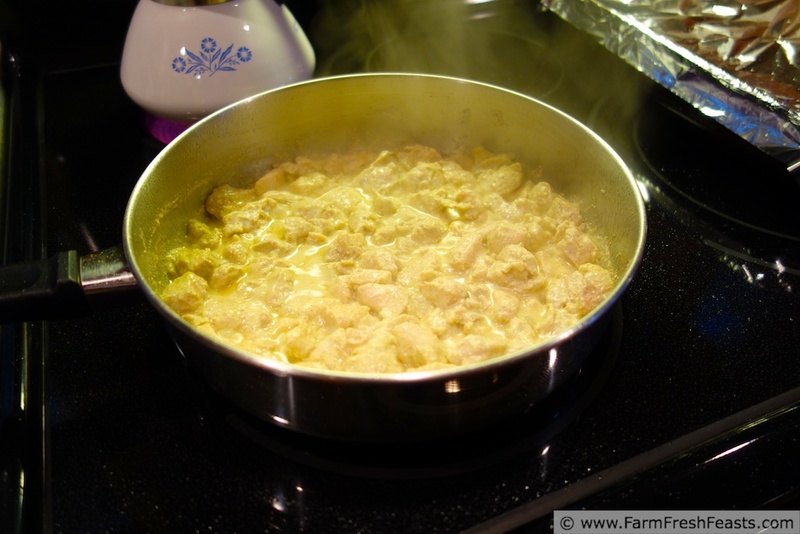 Before you clean the pan, saute onion and garlic in it, then add more spices and tomatoes. I cracked open the very first quart of tomatoes I'd put up in the fall. They tasted like crushed tomatoes, so clearly I did it right! Pour that on top of the chicken and chick peas in the slow cooker. Rebecca adds a jalapeno here but I wasn't sure about the oldest and youngest generations so I left it out. Combine the cornstarch and cream, stir into the slow cooker, and let it bubble uncovered for about 30 minutes. Serve over peas & rice, topped with chopped cilantro, with a piece of hot fresh naan on the side. Realize that the humans are not the only ones enjoying the smell emanating from the slow cooker. 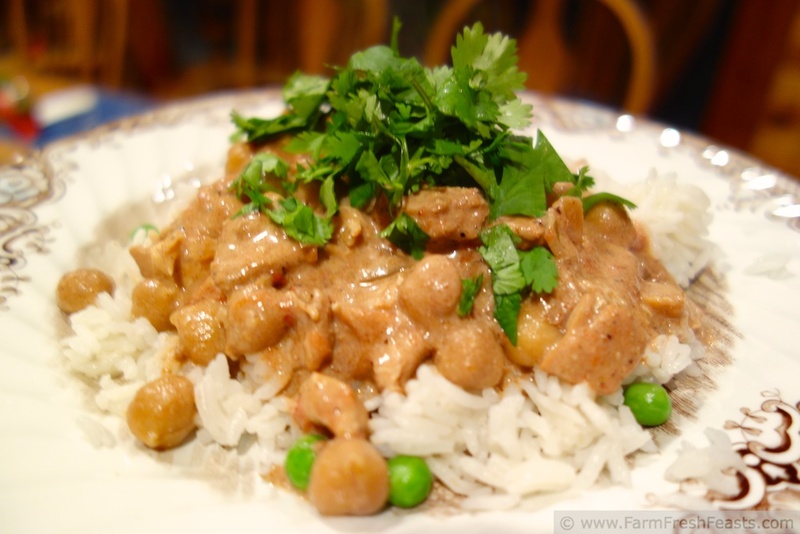 Please, go to Foodie with Family and try Slow Cooker Chicken Tikka Masala. It's delicious! This post is shared with What's Cookin' Wednesday at Buns In My Oven, Taste and Tell Thursdays, and What's In The Box at In Her Chucks the Farm Girl Blog Fest at Let This Mind Be In You, Strange But Good at Sprint 2 The Table, and The Clever Chicks Blog Hop at The Chicken Chick. I'm sorry, comments are closed on this post due to excessive spam. If you are a real person, I'd love to hear from you. If you'd like to share your thoughts, please go to my FB page. Thanks! That looks really good! And I think cooking in someone else's kitchen is so much harder than cooking in your own. Especially when they don't put things in the "right" spots! I agree. Heck, people in *my* house don't put things in the "right" spots sometimes! At least I've learned that *I* need to be the one to unpack the kitchen each time we move, so I can find my own "right" spots. I would really like to join a CSA sometime soon! Plus, I really love chickpeas so this sounds so perfect. Now is the time to join a CSA, and I'm happy to say I've finally mailed off my check so I'm all set for this year. Yippee! Wow this looks so appetizing that I am drooling all over my laptop. And I can see why the dogs are enjoying the smell too. I'm glad I'm not the only one who drools on her laptop! I am lovin' the step by step photos, but that doggy photo...oh my, SO CUTE!! It was reassuring to have my own stuff, when the rest of it was scary. I'm glad you like the dogs--I couldn't resist, they all looked so hopeful, yet were obeying the house rules of staying out of the kitchen. Ohhh yes, it really sounds scary to cook for a crowd for the first time! This dish looks amazing!!! I'm hosting a link up and would love to see your recipe there! Thanks for the invite--I'll come check it out. 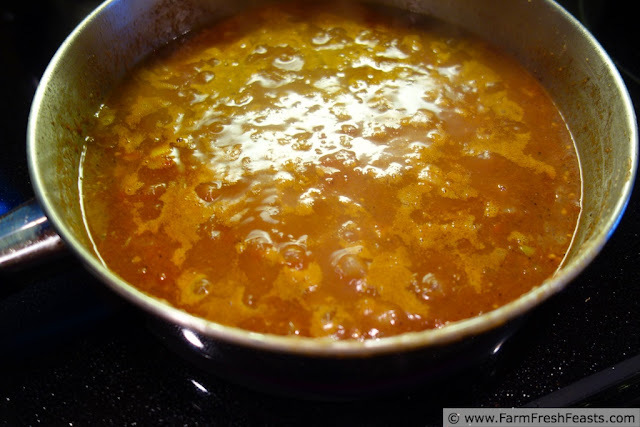 The next Indian dish I'd like to make is the Kaali Makhini dal from Haandi in Falls Church--I miss that now that we've moved. The dogs are so adorable! You're very brave to try this in someone else's kitchen for other people's consumption when you've never made it before! I'll certainly do it, but I usually dislike cooking in someone else's kitchen. I'm too "Type A" to just roll with it when I can't find things or they don't have a utensil or type of pot or small appliance that I think I need. It raises my blood pressure, lol! So when I do so I have to make sure it's a dish I'm familiar with making. This dish looks awesome though! I am definitely not Type A--there's too much in my daily life that is beyond my control, so I have to just roll with it. I did take darn near everything (including my own measuring spoons) so I controlled as much of it as I could. And Rebecca's directions are so clear and easy that it was super simple once I got started. And you are brave to try a new recipe on your in-laws. Glad it all worked out! I'm glad it all worked out, too! I suppose I could have scrambled some eggs or called for pizza had it gone south, but no need. Hooray! That sounds like a fun dinner and I want to hug and smooch all of those dogs!!!! The dogs sure got along great--it's nice to know Simon has friends to play with when we go visit. I have a recipe for slow-cooker tikka masala on my blog, too, and it's one of my favorites. 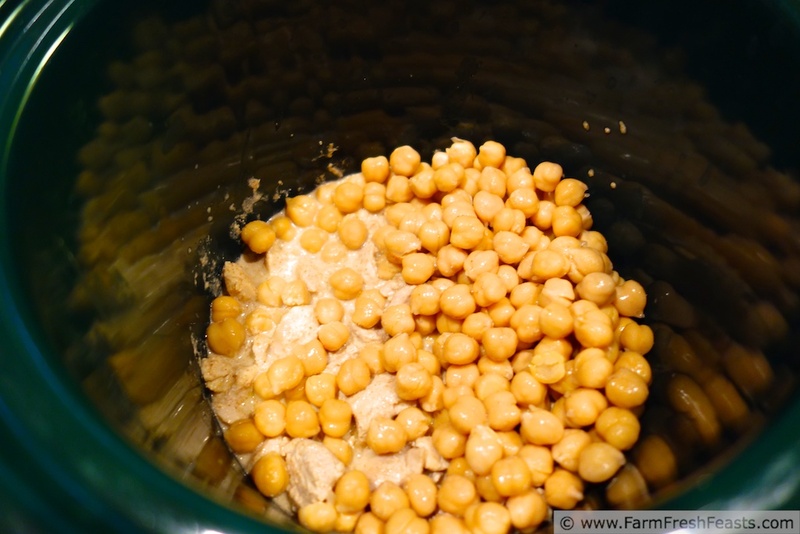 Yours looks great and I love the addition of chickpeas + the lighter amount of meat. YUM! I always thought of Indian meals as out of reach for my basic cooking skills, so I was thrilled to have produced this. And now I'm ready to branch out--my spouse loves to order Kaali Makhini dal and I love chicken Korma, so those are on tap. This looks amazing! I've never had tikka masala! Isn't that sad? That is sad, but sadder still is that I've never had a Cadbury creme egg brownie, nor donuts with Nutella. Cooking a brand new meal for the first time ever in someone else's kitchen....yeah, that's a terrifying thought. And yet, you conquered it. Why am I not surpised. I love the idea of this dish, plus you get to use the crockpot....maybe I could use all chickpeas or maybe some lentils instead of the meat. By the way, you hit the nail square on the head with this bit: "The wonderful thing about joining a CSA is that you've got seasonal farm fresh vegetables flooding into your kitchen every week. 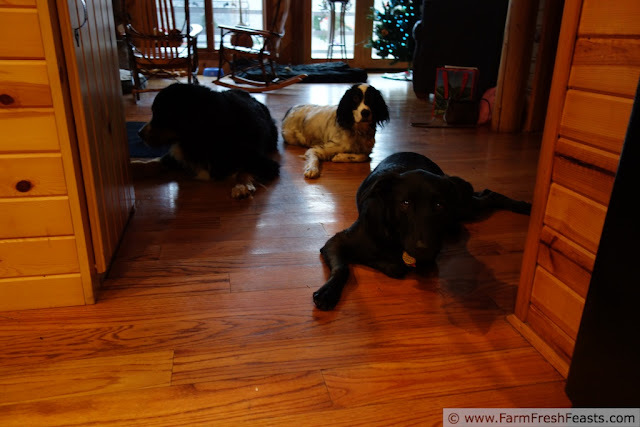 The annoying thing about being in a CSA is that you've got seasonal farm fresh vegetables flooding into your kitchen every week." I'm excited and nervous for the new season to start. Excited and nervous here, too, though we've got additional reasons than the CSA, I'm thinking. Oh wow, this looks fantastic! I've always wanted to try tikka masala...I may just have to try this out...AND yes, I will have to remember to turn the crockpot ON! Can't tell you how many times that has happened! It's the little things. My tea tastes so much better when I add a tea bag to the hot water in the mug. The crock pot works better when I remember to turn it on. The dryer dries laundry when I remember to push the start button . . . I'm so glad! Rebecca's recipe and directions are so easy to follow, with such a great result. I really like cooking at other people's houses, most of the time. When you are a houseguest and the cooking is much appreciated, yes! And during family reunions when the kitchen is the center of the action, yes! Sounds like your kitchen adventure was a success all around. Love those hopeful dogs too! You're amazing to like that--probably like public speaking, too? I do like to cook, though (um, you may have guessed) so I was delighted to be able to cook for a crowd. Of folks, not dogs LOL. Yum! 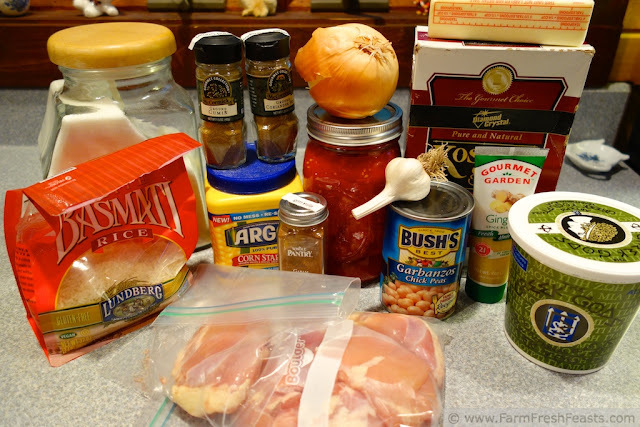 I have been a bit crock pot crazy lately so I am excited to try yet another delicious recipe. Me too! I'm trying to crock out as much as I can before Spring really arrives (snow on the ground still here) and I totally don't want it. Though there is Kalua pig in our future . . .